I'm so excited to finally share some of the post topics I've had in my head over the last four months. 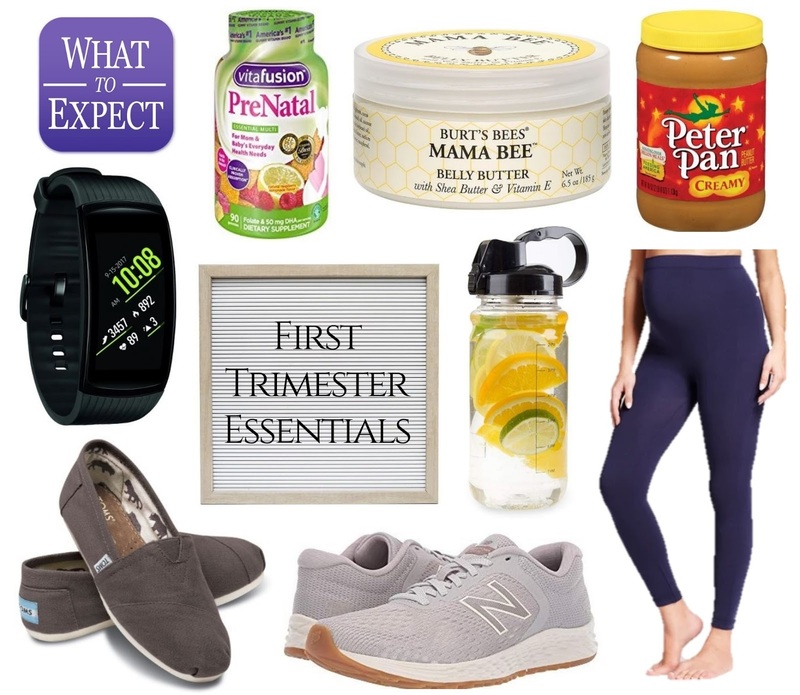 I've had little lists going in my planner, and when I first found out we were expecting, I looked through a bunch of bloggers' posts about what their favorite first trimester products were. Pregnancy App: When I found out I was pregnant, I switched my "Flo" app that tracks my cycle to pregnancy mode, but it doesn't have a ton of information. Instead, I downloaded the "What to Expect" app with weekly updates. My favorite part is definitely the Baby Size Comparison chart. I have "'80s and '90s Nostalgia" turned on (size of a Furby this week! ), but there's also your typical "fruits" category as well as "Movie & TV props" (imagine: the blue diamond from The Titanic the World's Best Boss mug from The Office). Vitamins: My PA suggested starting to take these months before I got pregnant, so I've been on these Vitafusion Prenatal gummy vitamins for a while, and I love these in the raspberry lemonade flavor. I've also tried the One A Day prenatal gummy before, but I didn't like the flavors as much. Some moms-to-be have experienced upset stomachs with pre-natals, and if that happens to you, make sure you take them with a meal! Stretch mark cream: This is something that I started at only a few weeks pregnant. I know I wouldn't have stretch marks yet, but they say it takes 21 days to form a habit, so I figured I would start right away so that when the time comes, I would already be using it. I love this Burt's Bees Belly Butter - unscented and doesn't feel too greasy! Food cravings and aversions: Through my first trimester, no smells really made me ill, but I didn't feel like eating anything greasy or sweet. I was eating every couple hours (and still am). My life was filled with everything bland: Cheerios, yogurt, bagels with cream cheese, and my biggest source of protein was definitely peanut butter. Fit watch: Mike bought me one of these for Christmas, but shortly after my 8-week appointment where they confirmed the pregnancy, he gave it to me. He knew I would still want to exercise as much as possible, but needing to keep my heart rate at 140 bpm or lower, I had to learn my limits. He saw how much I love it that I actually bought him one for Christmas, too. We both have the Samsung Gear Fit 2 Pro, and it pairs really well with our Samsung Galaxy phones. Letter board: Hello, what mom-to-be doesn't have one of these to take those weekly bumpdate photos?! Not sure how often I will share mine, but I started taking them at 13 weeks when I felt the first little bit of bump sticking out. I can remember feeling so giant, but now looking back on it, that little bump was definitely just food - haha! Here's a link to mine. Water bottle: As I mentioned, one of my only pregnancy symptoms during my first trimester were headaches. I have always tried to be good about drinking water, but sometimes you just forget! My PA told me about these awesome bottles (linked here) that not only make sure you're drinking enough each day but are also marked by the hour to ensure your consumption says on track each hour. You fill it up in the morning, drink it all the way down by 2pm, and fill it back up for the second half of the day. Each side of the bottle has hourly tick-marks to make it easy! Leggings: One of the best pieces of advice I received was to start buying maternity clothes as soon as your regular clothes start to feel snug. Why try to squeeze yourself into your old clothes when there you'll have to buy maternity clothes in a few weeks anyway?! Well, I definitely took this to heart and started shopping right away - haha. My favorites have been Target (for their loungewear), H&M (for their jeans and work tops), and Old Navy (for their dresses). With a little bump, some pregnancy pants didn't fit during my first trimester, but these leggings were perfect, and I have them in 4 colors now! Shoes: Comfort has been key for me this whole pregnancy. I bought my first pair of Toms a couple months age (I know, where have I been?! ), and I have these New Balance sneakers in every color I can find. PB is life. I love the app you are using! I loved seeing your baby compared to a furby! This is the type of app I want if ever pregnant. So much more fun than fruits and veggies! I love Toms shoes! I have a pair sneakers, wedges, and two pairs of slip ons... including the pair in your picture! I used a stretch mark cream religiously and I don't have stretch marks but I don't think it made a different. If anything, you just need that lotion to combat the itchiness so using it is a good idea. Comfortable shoes was a must for me! I lived in comfy sandals and it was the best. Congratulations!!!! I’m glad you’re feeling well.